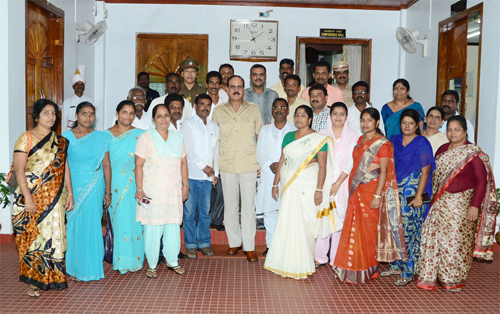 Port Blair, July 24: A delegation consisting of Adhyaksha and other members of Zilla Parishad, South Andaman called on the Lt Governor, Lt Gen (Retd) A K Singh at Raj Niwas and apprised him of the functioning of Zilla Parishad and Panchayati Raj system in the Islands. Interacting with them, the Lt Governor expressed that Panchayati Raj system is one of the main pillars of our vibrant democracy and we have to strengthen it further. He further stated that each level of the Panchayati Raj system has its own role to play and called for better coordination among the three tiers for proper governance and overall development of the Islands. The Lt Governor informed them that a Panchayati Raj Conference will be organized shortly in which issues and problems pertaining to Panchayati Raj Institutions in the Islands will be discussed.